I was born too early to benefit much from Sesame Street, but I still loved The Muppets. Kermit the Frog was my favorite character; alternatively in full control and overwhelmed, Kermit struggled to make sense of the nonsensical. To this day, there are times that I feel confronted with the same challenge. Among Kermit’s more famous quotes was “It’s not easy being green.” Kermit’s lament came to mind several times recently, during economic conferences that touched on the impact of climate change. As the earth warms and the consequences of warming become more apparent, the issue has reached heightened prominence. Debate is now centered on whether markets or mandates are the best tool to bend the carbon curve. We detailed the situation in last fall’s essay, “Changing Climate.” The globe has set a long string of record temperatures, and the frequency of severe storms has increased. Recognition that human production of carbon dioxide (CO2) has played a role in the process has become widespread, as has the resolve that something needs to be done. Arresting the problem will require significant structural and behavioral changes. 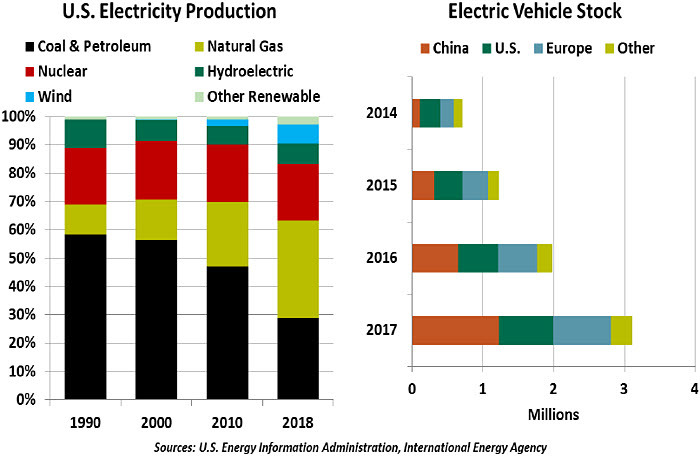 Accelerating the shift of power generation to environmentally-friendly fuels would require scrapping existing facilities and making substantial investments in new ones. In a similar vein, shifting cars from internal combustion engines to batteries will not be done cheaply or easily. These are just two of the many frictions that make the transition to a greener future expensive and difficult. And the faster the transition, the more significant these frictions become. Furthermore, reducing carbon footprints will almost certainly be accompanied by substantial economic dislocations. We’ve already seen examples of this in coal-producing regions around the world; we may one day also see them in areas that produce other fossil fuels. If one country moves more aggressively than others, it risks placing its industries at a competitive disadvantage. Transition plans will have to be carefully crafted. Addressing climate change has been difficult for politicians. They are often focused on the electoral cycle, which is much shorter than the time frame over which the consequences of a warming planet will be felt. But we are all at fault: behavioral scientists have established that human beings have inherent trouble estimating the long-term consequences of our behavior. Dealing with long-term issues like climate change is easily deferred. It does appear that global policymakers are beginning to take the topic up in earnest, though. Proposals to slow global warming fall into two categories: regulatory and market-based. In the former are concepts like the Green New Deal, which has been advanced by some of the newcomers to the U.S. Congress. (And which is covered in a separate segment in this issue.) Its targets present a high bar for industry and households to clear. On the market side are approaches like carbon taxes or cap-and-trade systems. Forty countries are already using one of these two devices, which attempt to provide incentives for producers and consumers to reduce emissions. Monies generated from carbon taxes are often used to promote investment in clean technology; cap-and-trade markets have the advantage of setting a desired level of emissions and letting market participants work towards equilibrium. Building on this, a rising number of portfolio managers is using environmental, social and governance (ESG) screens to select candidates for investment. Among the criteria used by these programs is impact on the environment; if the company is deemed to be too carbon-heavy, its stock is ineligible for ownership. To those who worry about sacrificing returns, the data suggest that stocks of sustainable companies tend to outperform their less sustainable counterparts. 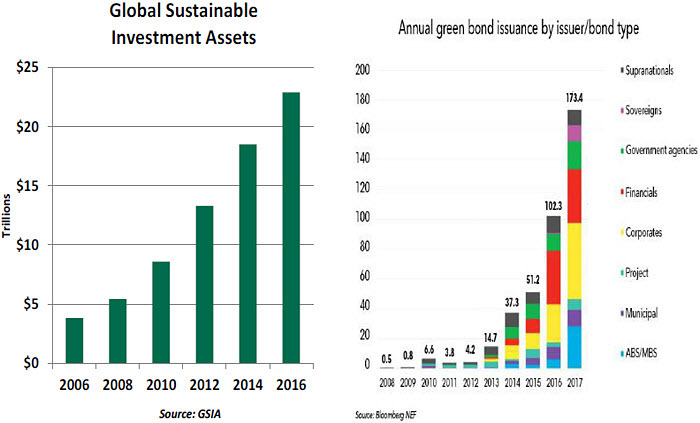 For investors who want to do something more directly to improve the environment, the “green bond” market offers an alternative. Proceeds from these issues are used to finance projects that address climate change. Examples include windmill farms, hydroelectric facilities and low-emission transportation systems. Among the challenges faced by green bond underwriters is determining what projects are truly “green,” and how to verify that the investments are delivering on their environmental goals. Nonetheless, interest in the sector is increasing, and the market is growing rapidly. Containing climate change will be costly. Decisions on when to incur the cost, and who will bear it, make the way forward difficult. But the cost of doing nothing may be more substantial. Damage done by natural disasters will require repair and re-insurance. Humanitarian aid for those forced to migrate from arid habitats could be substantial. And studies have suggested that the U.S. economy alone could shrink by as much as 10% this century if global warming continues at its recent rate. So in the end, Kermit was right: it isn’t easy being green. But ultimately, we may have no choice. Advocates for correcting climate change have gotten little love from the U.S. Congress. Even moderate approaches to deal with the problem have gone nowhere. Some congressional Democrats are now taking the opposite tack: Declare a bold strategy that enumerates the party’s goals in the extreme, and use it to frame future discussions. The Green New Deal (GND) follows this course. Its actual text is a brief, simple resolution: among other things, it calls for 100% of power to be generated from renewable sources, zero-emission transportation, efficient buildings and clean manufacturing. Its goals are broad (universal medical care and retirement security are also mentioned) and details are sparse. Proponents of the GND say this light design is deliberate. Just as the Depression-era New Deal was an amalgam of job creation programs, the GND comprises a wide range of initiatives to protect the environment. Some of the criticism of the Green New Deal has focused on its cost. Estimates for implementation are as high as $93 trillion over ten years, though the resolution’s lack of specifics leaves room for pessimistic assumptions. Supporters offer two responses. First, climate change’s casualties and losses are also substantial. And second, the United States holds the world’s reserve currency, and the Federal Reserve has an unbounded ability to purchase the bonds required to fund GND initiatives. This application of modern monetary theory carries risks and has many detractors, not the least of whom is Fed Chair Jerome Powell. We view the GND less as a proposal that has much chance of passage and more as an indication of how the climate change discussion is rapidly changing. Environmental impacts will become a necessary factor in any political or business decision. Arguments against future bills will need more justification than their high expense. Whatever the GND’s fate, its intent will make a lasting mark. For decades, petroleum has been the mainstay of the global energy system. Entire nations have structured their economies around the production and consumption of oil. But with greater recognition of the risks of climate change, we might be witnessing the decline of the Petroleum Era and the onset of the “Age of Alternatives.” Renewable supplies generated from the sun, the wind and the water are already playing a growing role in the world’s energy supply. 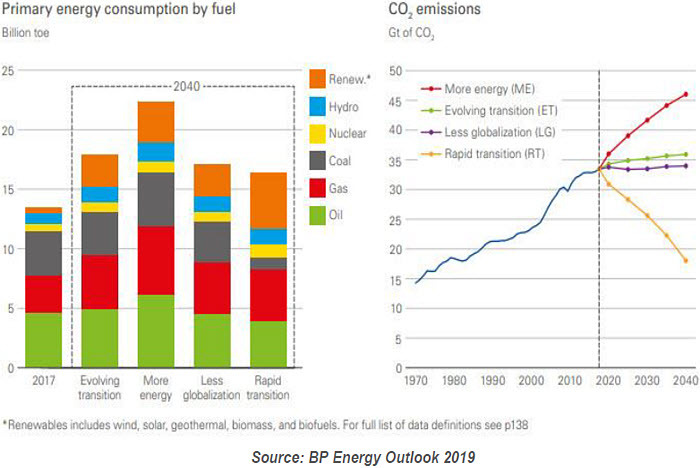 Energy intensity has been declining since the 1980s due to structural changes in production and consumption that have stressed more efficient use of resources. Despite this, world energy demand has continued to rise, and will likely continue doing so. Demand from advanced economies may plateau or even decline in the years ahead, but demand from populous, prospering developing nations such as India and China will remain on an upward trajectory. Oil and natural gas are likely to continue providing the bulk of global energy needs, particularly in the transport sector. However, the share of fossil fuels in the global energy mix is forecast to diminish gradually over time. The speed of adjustment will be determined by public policy and the private sector. A slow transition means oil-rich nations will likely have a long window of opportunity to diversify their economies and reduce their dependence on fossil fuel production. Many of the advanced nations that produce oil, such as the United States and Canada, have diversified economies. Reduced demand or fuel prices won’t deliver a major shock to these markets. Some oil-dependent nations will have a hard time adapting to the new reality. Certain countries with unfavorable geographic locations, dysfunctional government and a high reliance on fossil fuels, such as Nigeria, Venezuela and Iran, will struggle to diversify their economic development. These nations have profited from higher fuel prices but incurred heavy costs during downturns in energy demand and prices. Episodes such as the one currently enveloping Venezuela demonstrate that difficult economic times can lead to political unrest. 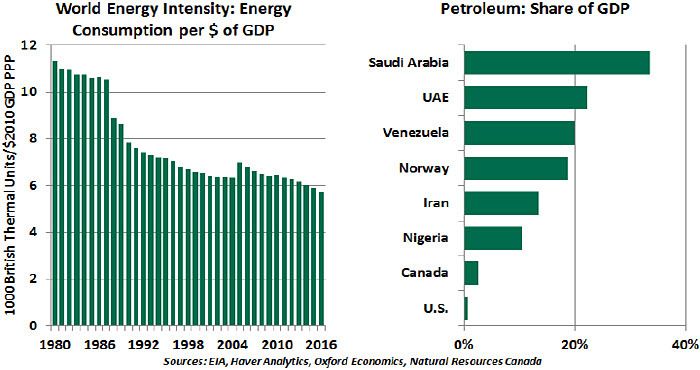 Other leading Middle Eastern countries (such as Saudi Arabia and the United Arab Emirates) remain heavily reliant on hydrocarbons, but have accumulated enough wealth to buy time to adapt. These nations are already making efforts towards diversification and have laid out plans aimed at that objective. This diversification will hold the key to future prosperity for oil-rich nations. Development of oil refineries might temporarily help those states involved in extraction of petroleum from beneath the earth’s surface, but not in the long run. For enduring success, nations will have to invest significant amounts in developing industries other than oil and natural gas. But because oil production remains the path of least effort for near-term growth, their perseverance may be tested. Plentiful sunlight in the Middle Eastern and African regions is ideal for generation of solar energy, meeting both domestic and rising regional demand. Other diversification measures could include the development of policies to attract foreign investment in different sectors, increased investment in infrastructure and the use of modernized irrigation techniques to boost food output. A well thought-out tourism strategy could also boost economic development. Dubai has grown its tourism sector remarkably, representing 20% of Dubai’s gross domestic product and about 6% of total employment. Saudi Arabia is also making efforts to boost tourism and develop other industries by channeling investments in chemicals, technology and healthcare sectors. Governments in many hydrocarbon-dependent nations have recognized that crude oil can no longer be the only economic engine, but they have shown little urgency to stimulate this move. Skeptics today see a lack of credible alternatives and predict the transition will be slow. But the transition to alternative energy and alternatives to energy must start now. Saudi Crown Prince Mohammed bin Salman recognized the “dangerous addiction to oil” that the Middle East faces. Recognizing the problem is only the first step toward a solution; solving it must follow.